Mr. Mo Yan is one of the leading figures in contemporary Chinese literature. His works depict the reality of life in China’s cities and farming villages with a unique blend of realism and fantasy, blazing a trail into the future for Asian literature. He is the standard bearer not only for Chinese literature today, but also the literature of Asia and the world. Mr. Mo Yan is one of the leading figures in contemporary Chinese literature. His works depict the reality of life in China's cities and farming villages with a unique blend of realism and fantasy, and have been translated into many languages, blazing a trail into the future for Asian literature. He is the standard bearer not only for Chinese literature today, but also the literature of Asia and the world. Mr. Mo Yan was born in 1955 to a family of farmers in Gaomi, Shandong Province, China. He left primary school due to the Cultural Revolution. After working as a cow herder, farmhand, and a temporary laborer in factories, Mr. Mo Yan joined the People's Liberation Army. He began his writing career in the 1980s. The themes that he has continuously depicted were discovered within himself. They focus on China's poverty-stricken farming villages and the people who live there. The author continues to create a unique literary world by blending narrative expression from the traditional Chinese literary arts with the avant-garde methods derived from modern Western literature. Mr. Mo Yan published Hong Gaoliang Jiazu (Red Sorghum: A Novel of China) in 1987. 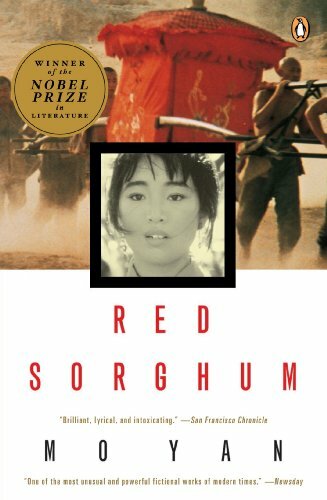 Set in an agricultural village during the war against Japan, the novel was turned into a movie by director Zhang Yimou that won the Golden Bear for Best Film at the Berlin International Film Festival. This literary work, firmly rooted in the vast spaces of China, garnered international attention. His work continued with the publication of Jiuguo(The Republic of Wine) and other novels. He was catapulted into the vanguard of contemporary Chinese literature, while gaining international recognition as a novelist after many of his works were translated into English, Korean, Spanish, German, Japanese, French, Vietnamese, and other languages. The author insists that his work is not an imitation of Western novels, but the creation of novels that incorporate the reality of today's China. He declared, "It is meaningless to follow others. If everyone heads West, then I will head East." He is not merely guiding Chinese literature, but demonstrating the spirit to drive into the future the literature of Asia that has been bound by the stifling influence of modern Western literature and the weight of history and tradition. His works represent the successful creation of a literary universe by alternating scenes of his hometown of Gaomi, a remote agricultural area, with the literary space of fantasy. Though they depict people and a place deeply rooted in the soil and culture of China, readers throughout the world can readily identify with them. This makes Mr. Mo Yan's novels international literature in the true sense of the world. A son of the vastness of China, Mr. Mo Yan has used literature to employ the richness and diversity of culture and the complexity and potential of human society. He has opened a path from Asia to the world, in the process demonstrating the significance of Asian culture to the world. He is indeed worthy of the Grand Prize of the Fukuoka Asian Culture Prizes. Public Lecture by Mr. MO Yan was held in ACROS Fukuoka Event Hall on September 17, and he introduced his idea and thought on his specialized field in his lecture, talks with panelists. Nobel Prize in Literature Awarded to Mo Yan ! !